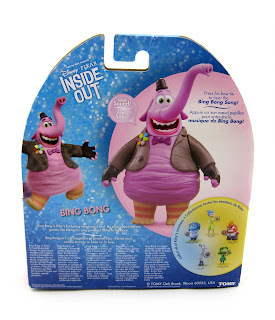 From TOMY Toys, here we have this fantastic Inside Out Musical Bing Bong figure! My post on this is long over due as I received this toy (and the entire action figure collection; more on the others soon) clear back in May...but better late than never! 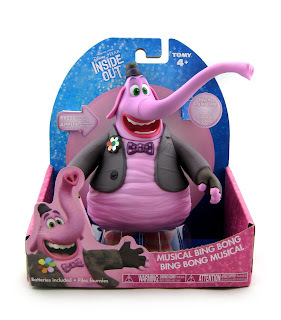 This figure is up there with my top favorites of the Bing Bong merch. Besides the near perfect likeness to the character, it's made of a durable plastic (the body is a harder plastic, the head and trunk are a bit softer), has multiple points of articulation (arms, head and trunk) and even speaks and sings. It's about 7" tall, is ages 4+ and requires three 1.5V LR44 button cell batteries (included). Retail was $14.99. You can't really beat this toy if you love Bing Bong! It's solid. "I'm part cat, part elephant, part dolphin." "I look like a lot of people." If you'd like to add this to your collection, you can pretty much still find it in stores. It's starting to go away though, so hurry! If you'd rather just pick it up online, visit the TOMY official website, eBay HERE using this direct link to current listings or on Amazon using the link below. Again, highly recommended!